Readers write, email and stop me at meetings and conferences where I’m speaking or attending. They talk to me about IN A HEARTBEAT: The Ups & Downs of Life with Atrial Fib. The comment I get from them, both men and women, is that they now ask more questions of their doctors and don’t stop until they are satisfied that they understand the answers. Pay attention to your body. Partner with your doctor, but do it from a point of strength and educate yourself. It’s easy. Get to know the Google button on your computer. Search for a keyword or book. For example, Google ‘books on atrial fib’, or all books and/or articles on a fib, atrial fibrillation, irregular heartbeats, heart arrhythmia and heart palpitations. Choose what you want to read online. Some of the articles are ads. Many will be promoting meds. About meds: Know what you are taking by both its brand name and its generic name. Know what it’s for, what its side effects are, how it may or may not be compatible with other meds and over the counter meds you take, what time of day to take it and what to do if you miss a dose. Your doctor may be impressed in the interest and effort you have taken to learn about your problem and realize that you want to help her or him help you. Looking up bios of health care providers is very interesting. When you mention to your doctor that you checked her or him out online, it’s one more thing that shows you are taking an interest in your own care. 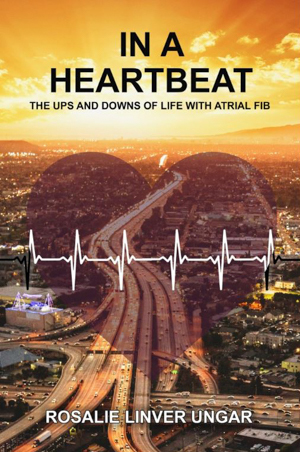 Check out more reviews and blogs on my Amazon author page for IN A HEARTBEAT: The Ups and Downs of Life with Atrial Fib. This entry was posted in Blog on October 15, 2017 by Mark Layman.